After weeks of dithering on the precipice of his own downfall, Silvio Berlusconi tonight survived a crucial vote of confidence, by one of the narrowest possible margins, allowing his government it to push through its proposed package of deeply unpopular austerity measures. The cutbacks and tax hikes had been demanded by the European Central Bank in exchange for its buy-up of Italian bonds on secondary markets, after markets turned their sights on Italy last month, pushing the government’s borrowing costs close to the level where Greece had previously required an EU bailout. But as Parliament prepared to vote on the austerity measures, violent clashes broke out between protesters and riot police. Downtown Rome was left billowing in smoke and littered with debris as at least 40 protesters were injured by random rounds of police baton charges. “The police displayed a disproportionate reaction,” one witness told La Repubblica. “They were hit with batons, even women. A mother, too, was pushed and fell to the ground.” Images on Italian TV showed several people with bleeding head wounds and other injuries. On that day, mass demonstrations are scheduled to take place around the world to demand global change and an end to the oligarchy of financial elites and their political patrons. Take the Square, the international wing of the 15-M movement in Spain, has transformed itself into the digital hub of these worldwide events. As the Italian crisis deepens, the people finally appear to be waking up from their deep slumber of political apathy. Tonight’s violence begs the question if Italy may soon be headed down the same road as Greece, where mass resistance to the austerity memorandum has made its implementation virtually impossible. 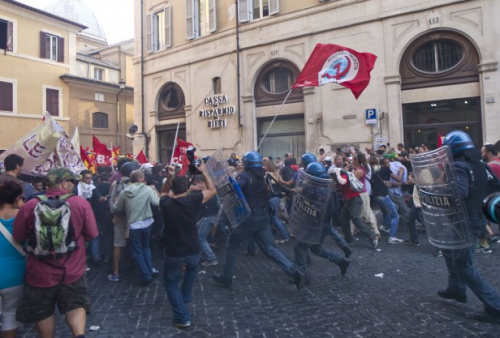 Either way, whatever happens in coming days and weeks, one thing has now become abundantly clear: the wave of protests and clashes that has been shaking the Mediterranean since the beginning of this year has finally reached the Italian shores. Things could start to get very serious very soon indeed.